1-Owner, Carfax certified, Shows accident history, No cosmetic or structural damage detected. 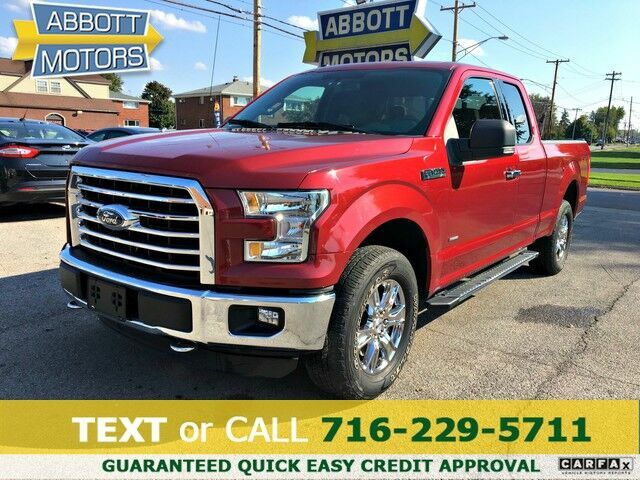 ABBOTT MOTORS, An exceptional car buying Experience, is offering this exceptional Ruby Red Metallic 2015 Ford F-150 XLT 4WD SuperCab FX4 for sale. CALL or TEXT (716) 229-5711 for quick answers to your questions about this vehicle. Your message will be answered by a real human never an automation. We stock only the highest quality vehicles which have undergone a full safety inspection, fresh oil change, professional detail and Carfax Guarantee. All vehicles come with a Written Warranty and Extended Warranties are also available. This Ford includes: POWER-SLIDING REAR WINDOW CHROME STEP BARS Running Boards/Side Steps TRAILER TOW PACKAGE Tow Hitch REAR VIEW CAMERA W/DYNAMIC HITCH ASSIST SAVINGS *DISCOUNT* FX4 OFF-ROAD PACKAGE *Note - For third party subscriptions or services, please contact the dealer for more information. * Your buying risks are reduced thanks to a CARFAX BuyBack Guarantee. The CARFAX report shows this Ford F-150 is a well cared for One-Owner vehicle. When Ford created this vehicle with 4 wheel drive, they immediately enhanced the performance ability. Easily switch between two and four wheel drive to take advantage of the improved steering and superior acceleration. The F-150 XLT 4WD SuperCab FX4 is well maintained and has just 38,441mi. This low amount of miles makes this vehicle incomparable to the competition. This Ford F-150 XLT 4WD SuperCab FX4 is in great condition both inside and out. No abnormal "wear and tear". Feel pleased in your decision to buy this Ford F-150 as it's still covered under the manufacturer's warranty. The 2015 Ford F-150 is built with pure muscle. Punch the throttle and feel the power of its torque and horsepower plant you firmly to the back of the seat. Why go with a basic vehicle when you can have it all in this well-optioned Ford F-150? An outstanding paint finish rounds out the wonderful aspects of this car. We are proud to offer this 2015 Ford that truly a "must-have." This vehicle's wheels are one of the many attractive features that this F-150 XLT 4WD SuperCab FX4 has to offer. More information about the 2015 Ford F-150: The F-150 might be the most important vehicle made by Ford. It continues to be one of their top selling vehicles, encouraging Ford to put their best foot forward with the 2015 model. The F-150 competes with the Dodge Ram, the Chevrolet Silverado and the GMC Sierra 1500 among others, in the full sized truck category. Ford is clearly pushing their new technology and new ideas with the F-150 offering lots of options not available anywhere else in this class, such as a 360 degree camera and integrated loading ramps stowed in the pickup bed. A smaller, more fuel efficient Ecoboost engine is also available for 2015, which should further improve fuel economy while providing the same kind of horsepower that would normally be delivered by mid-grade V8 engines. At the same time, the F-150 continues to excel at traditional truck tasks, with a best in class towing capacity of 12,200 lbs. when properly equipped. Strengths of this model include turbocharged engines, available in a huge variety of trims, Towing capacity, rugged durability, and improved gas mileage ABBOTT MOTORS has over 50 years of automotive experience! We are also a CARFAX Advantage Dealer specializing in outstanding customer service and satisfaction! We offer FINANCING FOR EVERYONE...ALL CREDIT APPS ACCEPTED. We look forward to helping you purchase your next vehicle. Apply Online 24/7 at Abbottmotors.com ... All Trade-ins Welcome... Same Day Delivery... Call or Text Today and See The Difference... We Look Forward to Serving You!! This vehicle may be subject to potential open recall(s). Vehicle recall information may be found at Safecar.gov. Please verify price, equipment, options and features with your sales rep before your purchase. We Look Forward to Serving You. *Tax, title, plates extra. All Financing On Approved Credit. We are a BBB accredited member.